With the city of Whiterock in ruins, Ghost Town Labs takes their madness to the metropolis of Genesis to see what their weapons can really do. 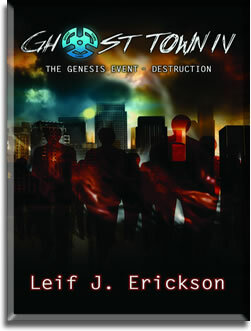 With the destruction of Whiterock, Dr. Tesla and Ghost Town Labs bring their madness to the metropolis of Genesis. With cameras, satellites and key personnel in place, Dr. Tesla has everything set to document the destruction of his ghosts. When the casket is opened and the Genesis Ghost unleashed, will anyone in Genesis be able to withstand the horrors of Ghost Town Labs? Ghost Town Labs has always relied on having the best information available. In Whiterock they monitored every event that happened in the little city. Now that they are moving to a major metropolis, they need to up the surveillance to see what their ghosts can really do. With key personnel set in place, Dr. Victor Tesla will watch as his ghosts bring about the total destruction of a major city. Recording everything as it happens. Dr. Tesla knows with each attack the price for his new technology will only increase. There will be buyers from all over the world ready to pay anything for the secrets of his ghosts. With Ghost Town Labs personnel posing as a high school student at a year-a-round school, a sales clerk in the mall, a teller at a bank, a city worker and a pair as cops, every part of the town will have boots on the ground gathering data, seeing how people react to the ghosts and seeing how the ghosts develop over time. The Genesis Event will be a very successful time for Ghost Town Labs. As the day progresses, the members of Ghost Town Labs quickly realize that not all is what it seems and the ghosts are far more powerful than they could have imagined. With each attack, the ghosts become more powerful and the members of Ghost Town Labs become few. Can the company survive its own event or will the ghosts destroy Doctor Victor Tesla and his madness?